Nothing starts the day off better than a good cup of joe, and where better to get your caffeine hit than at Andy’s Café. 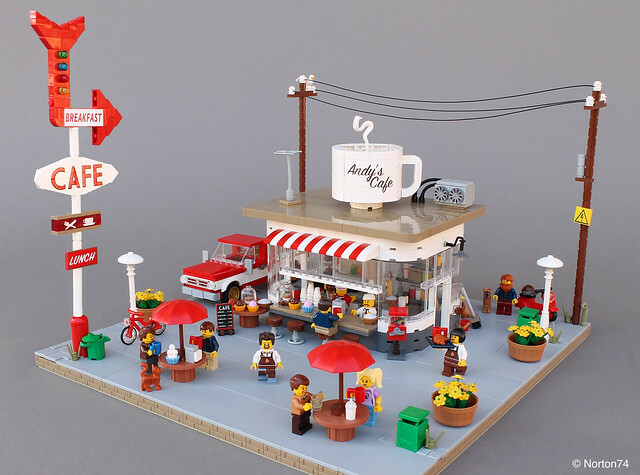 Built by Norton 74, this coffee stand boasts a beautiful retro modernist design, with an elegant curved façade, bustling terrace and funky coffee cup signage. The iconic ‘we’re here’ arrow makes sure you don’t pass this one by. Finding the perfect Christmas tree is an important part of the holiday season, at least in some parts of the world. And the North Pole is no exception. 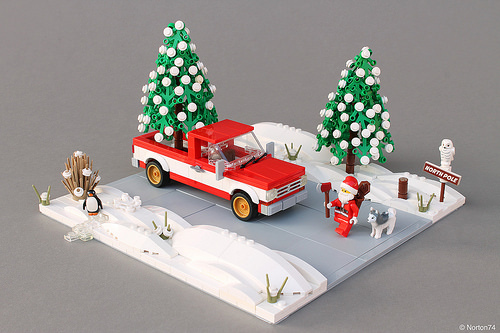 In this scene by Andrea Lattanzio, when Santa sets out to find the perfect tree, he comes prepared. Not only does he have a nice sharp ax, and a reliable pair of snowshoes, he brought his faithful companion in case of trouble. Santa lucked out this year and didn’t have to wander far off the road. 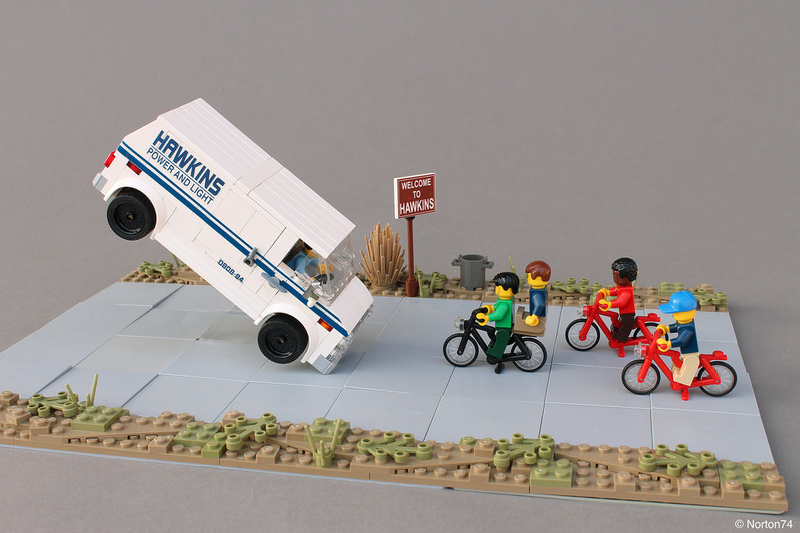 And speaking of roads, The North Pole has a superior infrastructure, with well-maintained roads, and industrial strength snowplows. These trees are very nicely shaped, and the softly curved slopes make great snow drifts. I ain’t afraid of no colds! The exploration of the alien worlds is often tightly connected with military conquests. 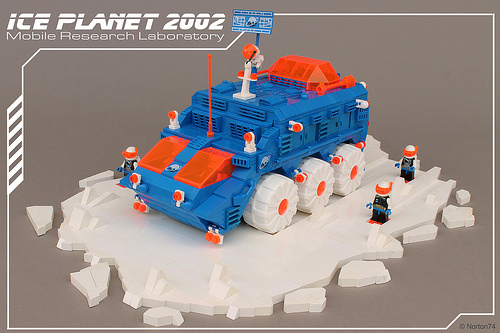 Italian builder Norton74 takes a rather peaceful approach to the idea and creates a Mobile Research Laboratory inspired by the good old Ice Planet 2002 LEGO space theme from 1993. 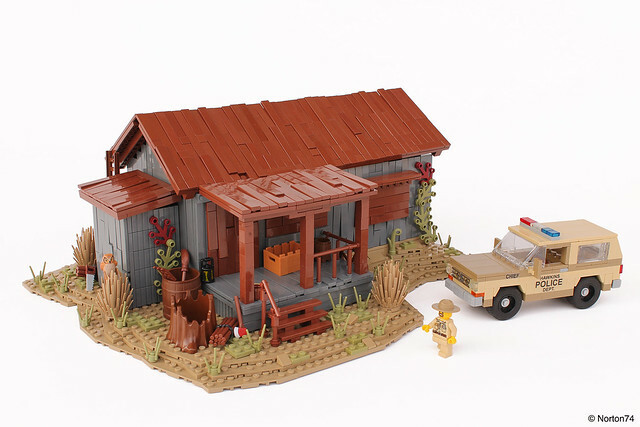 His design features significantly fewer pieces in white compared to the official LEGO sets, however a heavily armoured vehicle’s body looks absolutely stunning in plain blue. 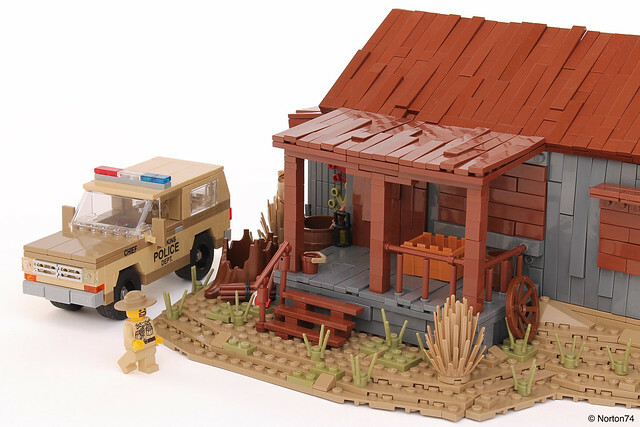 The retro vibe of the build is achieved through a very peculiar choice of pieces; note that there are almost no modern LEGO pieces and absolutely no curved slopes. Throughout America, a trip to the beach can often go hand-in-hand with a classic car show. People love the warm summer sun, the smell of the surf, and feeling the breeze blowing through their hair as they drive down coastal roadways. 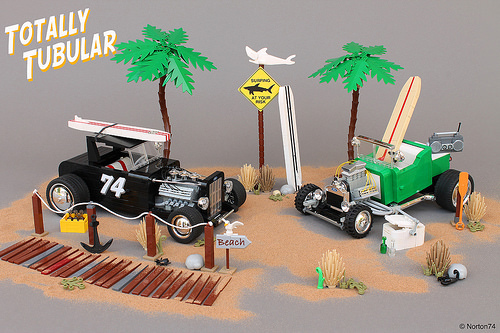 Taking this as inspiration, Norton74 has created a beautiful beach setting for two equally gorgeous hot rods. Early Fords are popular with hot rod enthusiasts, which is probably why Norton74 went with modified versions of a 1930s Ford V8 (left) and 1920s Model T (right). Thanks to the combination of curves and exposed engine details, the cars look both sophisticated and mean. They’re like the classic bad boy with the soft heart. A sign warns surfers to watch out for sharks, but I would probably be more worried about that sand washing up on the tile-built boardwalk. Scratch attack!